"Well of course I'd love to have more [Republicans/Democrats] join our side, but they're all crazy." In my experience, most people believe that they can pin down most of what somebody thinks based on whether they voted Republican or Democratic in the last mid-term. I've argued for a long time that this is a result of Wedging rather than reality: a few views from each side are amplified and accepted as universal by the other side. Pew just released a study that is probably the most interesting I've seen in years. Called "Political Typology Reveals Deep Fissures on the Right and Left," it breaks Americans into 9 political groups (including "bystanders" who don't get involved). 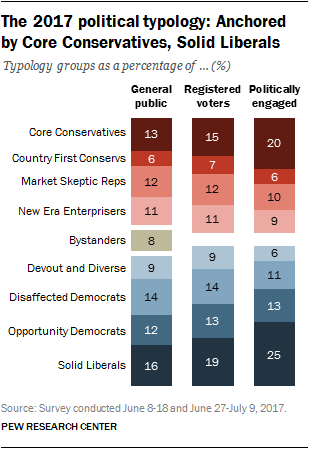 The most partisan (solid liberals and core conservatives) are by far the most active and engaged, controlling about half of the political power in each of their parties despite being 13% and 16% of the population. This reaffirms that the tail wags the dog. Some of the less partisan groups break the mold in surprising ways. "Devout and Diverse" Democrats are quite religious and have views varying across the spectrum. New Era Enterprisers are your "socially liberal / economically conservative" group, and market skeptic republicans are pretty much the opposite: they're socially conservative and don't like the free market. These two groups couldn't disagree more. The very deep fissures in each side of the political spectrum shows that they are fragile coalitions which can be easily rebuilt. Right now most Republicans back Trump, but based on their views it doesn't make sense for many of them. Many Democrats would seem by their views to have no interest in the likes of Sanders or Warren. What Happens When We Break Stereotype? Think about your stereotypes of each party: is everyone in the Republican party now an isolationist or in favor of global involvement? How many are anti-trade and anti-immigrant, and how many are pro? Same goes for the Democrats. There are Democratic coalition members that are more pro free-market than some Republican ones, and vice-versa. Some Democrats and Republicans are pro global involvement; some against. Some Republicans and Democrats want global free trade; some want protectionism. This study very decisively shows us how diverse each of the parties are. The 4 left- and right-leaning coalition members are all substantial, and none are dominant. In reality we are looking at parties that are each a fairly cobbled-together mess of people. So what happens when we acknowledge that? Could you imagine Democrats being able to reach out to win over some of the 3 non-conservative coalition members with certain forms of marketing? Could they appeal to Country First's worry about job security, or Market Skeptic's sense of economic unfairness, or New Era's desire for a socially open society? Could you imagine Republicans being able to reach out to the Opportunity Democrats with a pro-job message, or the Devout and Diverse about their focus on families? We can see that these parties can be reshaped. Each party has at least one group that doesn't really feel that it is well-represented in the party. Donald Trump is alienating some of the Republicans' coalition members; they will continue to be interested in alternative options for a home. It's also worth noting that these coalitions are morphing. Just 3 years ago, the groups were much more familiar (at least to me). There weren't country-first conservatives, nor anti-market Republicans. Democrats didn't have a large disaffected group. These changes mean bigger divides within each party, each of which is a crack that can be exploited by some visionary looking to build a new political coalition. A critical presidential election in which the electorate changes its voting pattern. A major conflict or issue that divides the electorate. A political party weak enough for either a new party to take control or to reflect a significant change in voter characteristics. The surprise of 2016 showed that the electorate's pattern changed in a surprising way; we likely have more than one issue that divides the electorate. And while both parties appear strong, they are in fact both highly fractured and divided. So maybe a coalition realignment is due. Also important to note: shifts that seem very sudden have often been in fact quite gradual. Even the 1960s Republican/Democratic switch in the south took at least 40 years to creep along, rather than simply being a result of the Republicans waking up one day with a strategy. The final result was indeed dramatic, but the change was coming for some time. If we're right about Wedged, this change has been creeping in for some time. It's hard to say when the switch will flip.